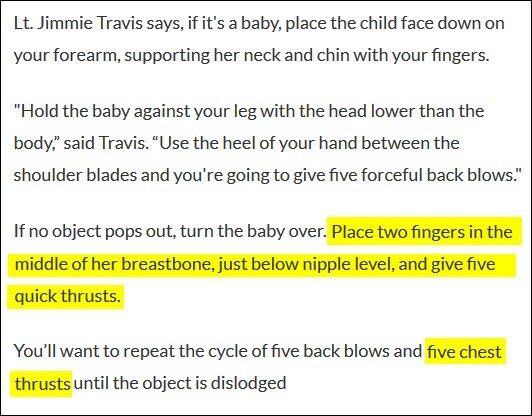 How should a mainstream news organization respond after being made aware that a published story contains bad information that may seriously injure babies? In somewhat identical situations, here's how FOX TV News affiliates in Oklahoma City and Cleveland responded. One deserves to take a bow. The other deserves to get sued. 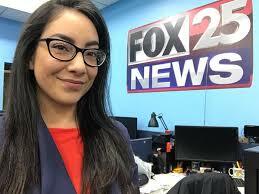 On June 13, FOX25 News in Oklahoma City aired How to help someone who's choking by staff reporter Jordann Lucero. 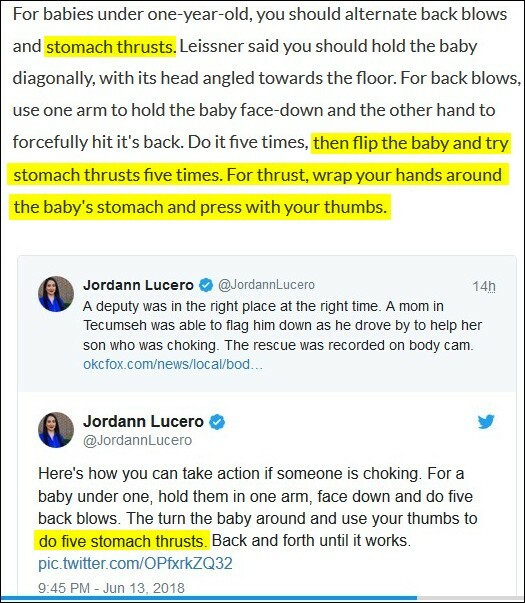 No legitimate medical organization or medical expert recommends performing stomach thrusts (aka abdominal thrusts aka the Heimlich maneuver) on babies. As I've reported, executives at the American Heart Association (AHA) and American Red Cross (ARC) wrote me that the treatment "may cause injuries" to babies. 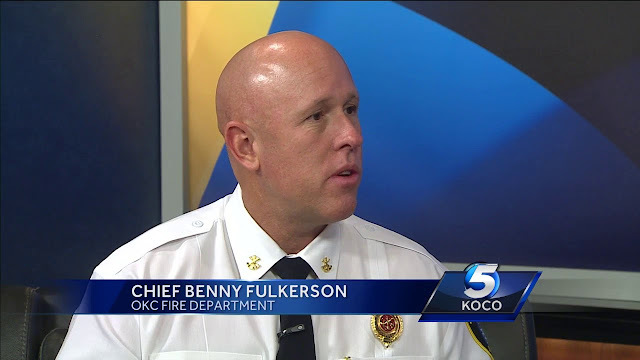 After spotting Ms. Lucero's report I e-mailed AHA and ARC guidelines to Oklahoma City Battalion Chief and Public Relations Officer Benny Fulkerson. Sir, we just want to thank you for bringing this matter to our attention. After review, it has been determined that you are absolutely correct. The treatment demonstrated in the video was not in accordance with the AHA [American Heart Association] standard which we operate under. Please know that we feel terrible that this occurred, and we are working with Fox 25 to correct this information for their viewers. As a public safety organization, we take extremely seriously our role as an authority about all things related to fire and life safety. We do have amazing personnel who work very hard every day to serve our citizens. When we make mistakes, we take every measure to correct them and learn from them. Again, thank you so much for contacting us about this. We are eager to get this information corrected. 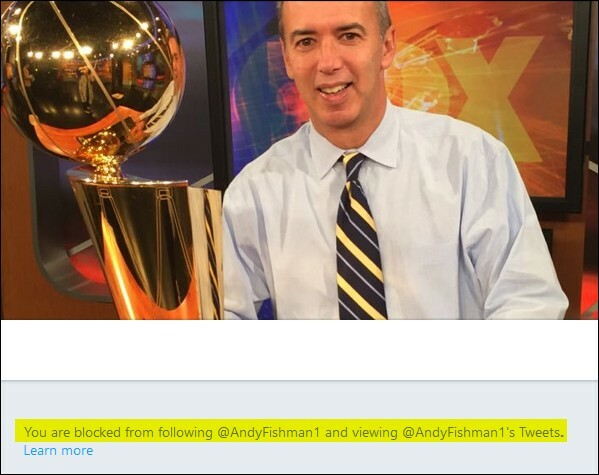 I then received a thank-you from FOX25 New Director Adam Pursch who informed me that the story was being re-reported. I sincerely thanked Battalion Chief Fulkerson and Mr. Pursch for their professionalism and commitment to public safety. I can't say the same re: the following mess. Who'd be irresponsible enough to stand behind the recommendation that first responders shouldn't worry about breaking a baby's bones? 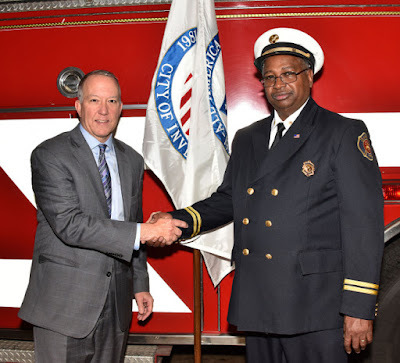 Among others: Akron Mayor Daniel Horrigan, Fire Chief Clarence Tucker, and FOX8 News Director Andy Fishman. As highly trained first responders, we [sic] trust and stand by the information provided to us by the Akron Fire Department. Per the item you're reading, I don't.